Flairtender is a VR bartending game that has you mixing drinks, with style! Create all of your favorite classic cocktails and get more money based on accuracy, speed, and flair! Released on May 19th for on Early Acces via Steam for the HTC Vive and Oculus Touch. 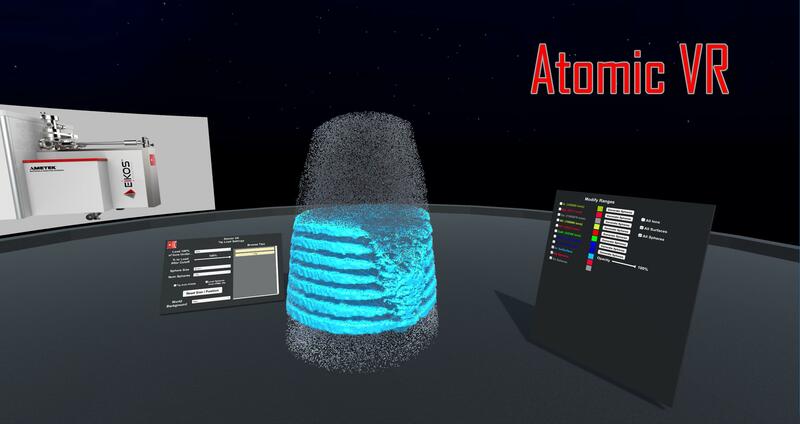 Atomic VR is an application that allows the viewing of atom probe data in virtual reality. It was built for CAMECA Instruments to show off their data in a new and interesting way. Allows the user to load any CAMECA data set, scale / rotate data, customize ion colors, and synchronous controls for a user on PC. GoalkeepVr is a virtual reality sports game that puts an arcade like twist on goalkeeping, created in Unity. It released on Steam on January 6th 2017 for the HTC Vive / Oculus Touch and has received positive reviews. Perfastion is a virtual reality puzzle game that is similar to a classical board game from the 1970’s, requiring the player to place the randomly generated pieces into the corresponding slots before the time runs out. It was released on February 16th, 2017 for free on HTC Vive / Oculus Touch. on itch.io.